Edit360 is an app for iOS that can straighten your 360 photo (level the horizon) as well as fix the 360 metadata in your photo. 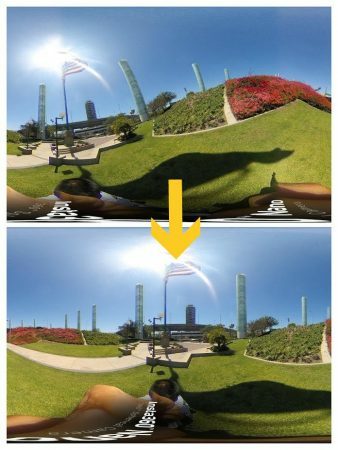 edit360 is the iOS version of Theta Converter app for Android, an app for re-orienting Ricoh Theta 360 photos based on the vertical correction information embedded in the metadata from the Theta’s sensors. The current firmware of the Theta now bakes the correction into the photo (making correction via metadata unnecessary). However, Theta Converter can also be used for straightening 360 photos manually even without the embedded vertical correction information by using pitch, roll, and yaw controls. To illustrate, here are sample photos, without horizon correction and with horizon correction. 2. The controls on the upper right control pitch, roll, and yaw respectively. For a level horizon, look for perfectly vertical objects and adjust the photo so that they are perfectly vertical, at least along the middle band of the photo. If the horizon looks asymmetric (like a sine wave), start with roll first. If the horizon looks symmetric (like a hill or a trough), start with pitch first. Make it look as good as you can before moving to another parameter as necessary. In this case, because the horizon looks like a sine wave, I corrected for roll first. The flagpole, the buildings, and the pylons should be perfectly vertical in the real world, so I tried to make them look vertical first. After making it look as good as I could, then I switched to making small adjustments with pitch. Here’s how it looks with roll correction. 3. If you want, you can also change the heading by using the yaw. The part of the image in the center of the photo is the first thing that the users will see. In this case, I adjusted the yaw to move the flag to the middle. 4. Lastly, you tap on the save button (on the bottom right) and you’re done! It will be saved in a separate album in your camera roll called edit360. 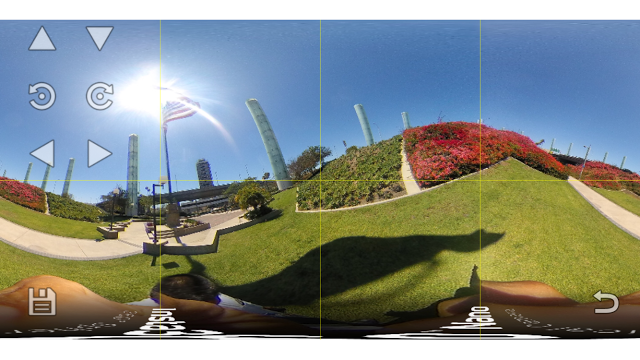 The edited photo will have the correct 360 metadata as well. 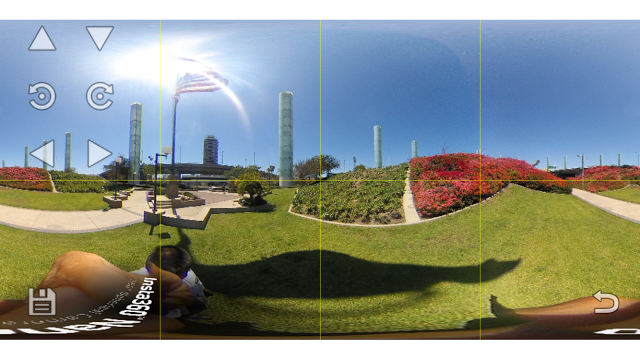 Edit360 can also be used to fix the metadata in your photo. Just open it from Edit360 and save. 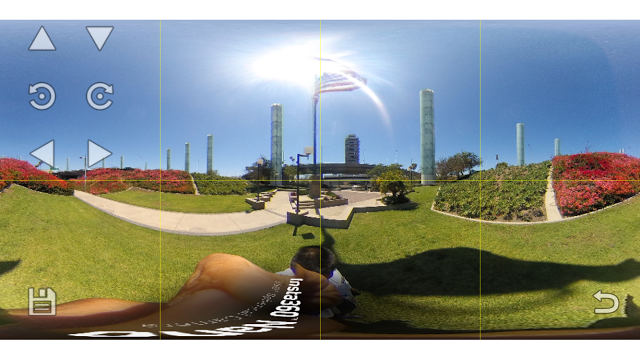 The resulting photo will have the correct 360 metadata. Edit360 is available as a paid app on the App Store. If you don’t need or want the straightening function and just want an app to fix the 360 metadata, check out meta360 for iOS, which costs $1 less. TECHNIQUE: Panning a 360 camera: yes, you can!